You light up my summer. You’re the best. What would July be without you? 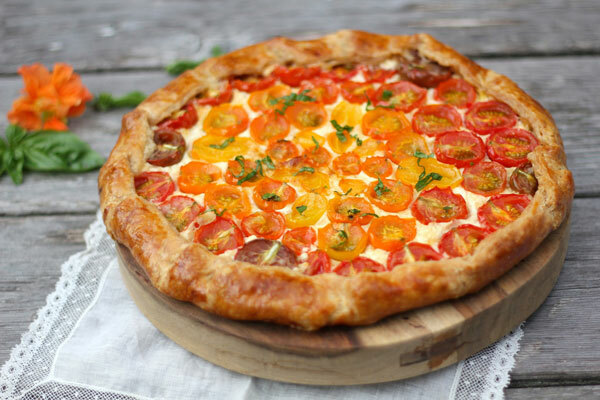 That is the love declaration I’ve been silently making every time I bite into this cherry tomato galette. I think the tomatoes may be telepathically getting the message. This year, we planted several varieties in our garden including Black Cherry, Galina, and Green Grape. I can’t wait to taste them all but in the meantime, while I patiently wait until the day I can devour them, my expert tomato-growing friends at Wysmykal Farm rescued me from a sad case of tomatoelessness. They loaded me up with cherry tomatoes so colorful, sweet, and bursting with flavor that they could be sold in a candy store. Perfect for making a cherry tomato galette. I’m so hooked on this little savory pie that I’ve made it three days in a row now. It looks a bit like a reverse pizza, with the tomatoes on top of the cheese. Given the chance, I will always choose a flaky tart crust over the chew of pizza dough. It must be the French side of me, I’m a sucker for butter. The wonderful thing about galettes is that they are meant to be a little rough and rustic-looking, so it doesn’t matter too much if they’re on the messy side. This galette pastry, adapted from Smitten Kitchen, is so remarkable that everyone who has sunk their teeth into it has commented on its tender flakiness. The original recipe calls for sour cream (feel free to use that) but I was pleased to see that full-fat yogurt does the trick since that’s usually what I have on hand. This recipe is very adaptable, you could easily sub the tomatoes for other vegetables. I tried roasted beets in one, and roasted fennel in another, both were wonderful. One of the secrets to a successful crust is to ensure that your flour and butter are chilled. As you may notice in the video, I like to use my hands to make pie dough and I can usually get away with this because I almost always have cold hands. If you have warm hands, this might heat up the butter too much. Trust me, you’ll need to make this one, it’s quite scrumptious. And just screams summertime! 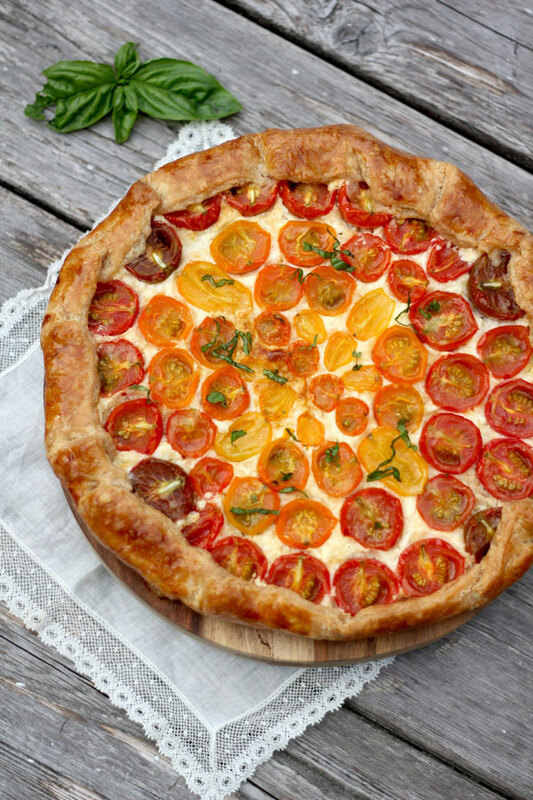 Watch how to make food blogger Aube Giroux's cherry tomato galette recipe on the Kitchen Vignettes blog. First, make sure your flour and butter are chilled. In a medium mixing bowl, mix the flour and salt together, then cut the butter into the flour with a pastry blender, a food processor, or two knifes, until the butter is evenly distributed with the largest chunks about the size of peas (these chunks of butter are what will give your crust its delightful flakiness). In a small bowl, mix together the ice cold water, cold yoghurt, and 2 teaspoons of lemon juice. Pour this mixture into the flour. With a wooden spoon, gently mix together, just until you can get it into a ball. It doesn't have to be perfectly mixed, you want to avoid overworking the dough. Flatten the ball into a disc and wrap in plastic or parchment paper and chill in the fridge for at least 1 hour. On a floured surface, using a floured rolling pin, roll the chilled dough into a large round about 12 to 14 inches wide and between 1/8 to 1/4 inch thick. Place the rolled-out dough on a piece of parchment paper on a large baking sheet. (You may find it easier to handle the dough if you roll it out directly onto the floured piece of parchment paper). In a small bowl, mix the ricotta and grated parmesan together. Crumble and spread this mixture onto your dough, leaving a 2-inch border all around. 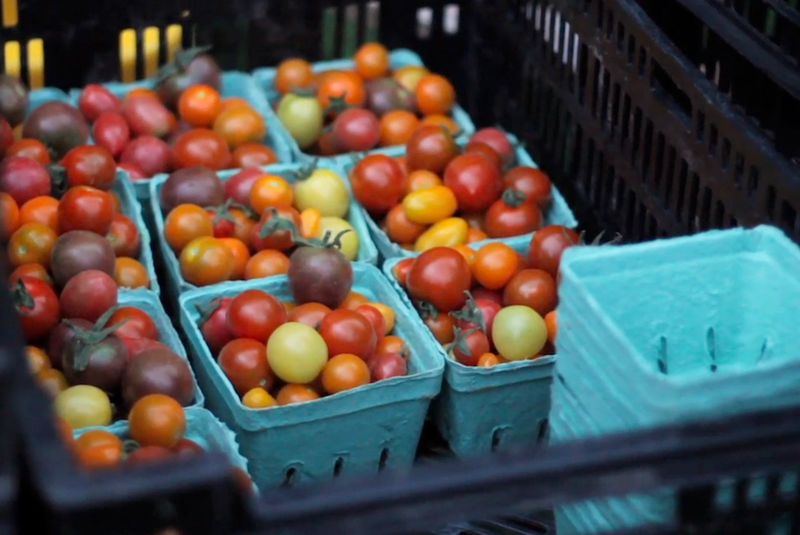 Place your halved tomatoes, cut-side up, tightly together to fill the circle, leaving the 2-inch border intact. Fold the border edges of the dough inwards so that the tomatoes are encased by dough around the edges but exposed in the center. Brush the edges with the egg yolk glaze. Season with salt and pepper if you wish and drizzle the olive oil on top of the tomatoes. Bake in a 375 F oven for about 45 minutes or until crust is golden. Remove from the oven, let it cool for a few minutes before sprinkling shredded basil on top. Slice and serve.